Is Sugar In Fruit Healthy? That lady up there isn’t avoiding fruit. She has made a lovely sculpture to express her love. I am much more aware of sugar in the food I am choosing thanks to your blog...However, I am confused as to the sugar in fruit. Is this natural sugar ok? I’m so happy I have made Wendy aware of sugar, but I don’t want her to stop eating fruit. People have dismissed the health benefits of fruit because it has sugar and I need to stand up for fruit. Carbohydrates have been slammed because of the high protein - low carb diets that people follow. I wrote my response to those programs here: Surprise! Carbohydrates Are Not Evil . My perspective is that humans have been evolving with fruit and eating fruit for as long as there have been humans. This makes fruit one of those foods that we are adapted to eat to fuel all the systems in our body. Take a look at cancer prevention as an example. The compounds that naturally occur in strawberries have been shown to stop the growth of cancer cells in test tubes (Strawberry Extracts Inhibit Growth of Human Cancer Cells In Vitro). Can mashed up Twinkies do that? I will happily eat my strawberries with 7 grams of sugar per cup and get all that cancer fighting goodness that my immune system can use. My point is that you need to evaluate the food that the sugar is in. Over and over on this blog, I talk about watching out for sugar added by food manufacturers. For example, when I talked about Craisins this week. They had added sugar and I didn’t think most people realized it. But, an apple with its 19 grams of sugar is another story. You are getting fiber, Vitamin C, iron, calcium, and a host of micronutrients that are necessary for your body to function properly. These micronutrients are trace minerals like zinc and chromium which aren’t even listed on labels because we need such a small amount. Since you need sugar to function, why not get your sugar from the source with all the other stuff you need? I believe it is the added sugar in processed foods that is making us fat and unhealthy not the sugar incorporated by a tree into an apple. What is your take on fruit? Do you avoid it because of its sugar content? What Stops You From Eating Healthier? I entirely agree - eating fruit is much better than the processed sugar alternatives. However, I have read that we should not exceed the 2 per day rule. Which is sad, because I use up those two servings by midday. Does anyone know if this is true? How many servings does everyone else eat a day? Lisa, I'm so glad you wrote this post. I love fruit, I eat is several times a day and like you; it keeps me from snacking on the bad stuff. But I have a lot of clients who are afraid of fruit because of it's sugar content. It's hard to convince them that fruit is not the enemy. How can anything so natural be the enemy? One of the best times to eat fruit is right after you workout. Yep, my go-to post workout snack is Greek yogurt and a piece of fruit. Not a GNC post-workout shake that tastes like cardboard. Great post! Fruit is good for you!! I don't care about the sugar in fruit, it's way better then the processed crap out there on the markets! Give me a juicy orange, a tart apple, sweet strawberries anytime over pre-made stuff!!! Thank You Thank You for writing this!! I "do" Weight Watchers and have lost over 80lbs. I get so tired of people knocking the "free fruit" and while I don't think that we should over-eat any food, I doubt that eating fruit has caused so many of us to be obese!! I love fruit..yes, even bananas!! Lisa - thanks for addressing this. You and I shared email about this a while back and it scared me that people weren't eating fruit because of old point issues and sugar. There isn't much that's better for you than fruit! I didn't get this fat from eating too many apples. The sugar in fruit keeps me on track! If it weren't for fruit I would have no luck in eating healthy at all because I have a ridiculous sweet tooth! Great post. Bananas help keep me full. Thank you for this post! I get so frustrated when I'm told to limit my fruit to lose weight. I recently heard this from a nutritionist at my gym. I eat 3-4 serving of fruit everyday and I've lost 50 bls. I'm personal proof you do not need to limit your fruit intake to lose weight. All sugar is not created equal. Another great post! I didn't realize that people were still apprehensive about fruit. I have diabetes and am on meds for it. When I drink my fruit heavy green smoothies ( Which I learned about thanks to you! ) on a regular basis, my sugar control is perfect. On the other hand cookies etc, will make me spike too high. just stumbled across your blog and i love it!! i've been doing the Game On! diet with some friends and have lost 15! of the most stubborn pounds ever!!! i have fallen in love all over again with a simple grape. the game on! diet has you eat 5 times a day (protein, carb and fat) when i need a feeling of sweetness i get 10 grapes out and it has been just the icing on the cake. i do admit, it's harder for me to want to eat my veggies verses my fruits, but with the game on! diet you are required to eat 2 fistfuls of veggies with 2 of your meals or you don't make your points...something about earning or losing points that makes you eat them...it's complete mental craziness. I LOVE fruit! but never drink my fruits, i'd rather savor it in bites...apple pear, grapes, bananas...yummy!! 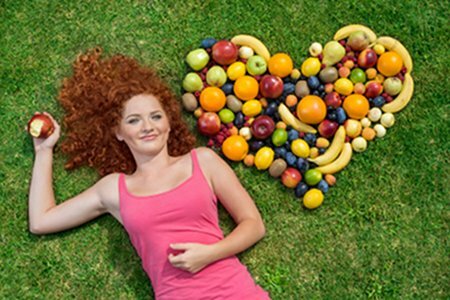 Thank you for spreading the word about the goodness of fruit. It drives me nuts when people insist that the fruit in sugar in bad and thus avoid these nutriet powerhouses! I was trying to follow WW and couldn't understand why I was not losing. My friend pointed out that I was probably eating too much fruit, since it's "free" on WW. When I began eating more veggies and less fruit, I finally started to lose weight. I cut WAY back on carbs - but did not completely cut them out - and chose better carbs when I did eat them. I cut way back on sweets, and became much more aware of sugar intake. My friend also pointed out that if you would give your body some protein to process along with your fruit, you will not get the sugar spike/drop thing. Like you always say, SG, apples w/peanut butter, or like the post above having Greek yogurt with fruit. So, I think the protein along with the fruit is key. I also thank you for addressing the fruit issue. I eat 3 to 5 fruits a day. I have lost 70 pounds on WW since February. I don't get the griping about the zero point fruit that I hear about the new program. Cathy, I don't know where you heard about limiting your fruit to 2, but that is not true!! WW wants you to have AT LEAST 5 fruits/vegetables combined per day. I think healthy eating nutritional guidelines -- the food pyramid -- say you should have 9 per day combined of fruits/veggies. I have a sweet tooth, also, and fruit definitely helps me with that. Keep up the good posts. I am seven days into the Eat to Live diet, feel great lost six pounds. You are supposed to eat aleast four frous per day on this plan. Like my Weight Watcher leader says "we didn't get fat eating fruit"!!! So true. Weight Watchers allows fruit free (no points) but in moderation.